wrench Get A Free Quote Now! When it comes to a massive investment such as your home or commercial business property, you want to ensure it is protected from termite damage. With one in two homes affected by termites, it makes sense to organise a regular termite inspection. Perth residents can now rest easy knowing their property is protected thanks to the team here at Termipest. After inspecting your property, we can provide a cost-effective termite treatment that will offer the best results for your situation. We use state-of-the-art equipment for termite control treatment and employ a tailored approach that ensures you won't have a problem with them any longer. We can also organise multiple baiting systems to find termite activity on your premise. Organise your inspection today! We offer Pre Purchase Termite Inspection, Pre Construction Termite Treatment and more! No Termites for 5 Years! When you are looking for termite treatment in Perth Australia, you want to choose a solution that is going to offer the best long-term results. Here at Termipest, we are so sure we can cater to your termite treatment needs that we will back our claims with a warranty. We give a 5-year warranty without a binding contract. This offers great peace of mind as we will treat your property again at no cost to you if termites return within this timeframe. To offer the best results, we have a range of products to suit your needs. Termipest is not affiliated with any chemical company and will independently recommend the correct product needed. With our termite barrier treatment, you get a complete solution that will not only treat active termites, but will help prevent future infestations. We offer products that are safe for families, pets and plants and we also offer free pest cover. To book an inspection for your property, or to discuss your needs with a member of our team, please call 1300 66 2847 or send us a message via our contact page. Has a timber white ant inspection on your Perth property revealed a problem with termites? Here at Termipest, we are experts at white ants control and can offer a range of treatments to rid your home or commercial property of unwanted visitors and protect it from infestations in the future. We pride ourselves on offering competitive prices to our clients, and guarantee long-lasting results for peace of mind. With a staggering one in two homes being affected by termites, it is important to find an effective solution should your property fall victim to the pest. As every home and termite infestation is different, our team takes the time to fully understand your situation before suggesting a white ants treatment that we believe is going to offer the best results. As we are not affiliated with any chemical companies, we choose products that are going to be best for your situation regardless of the brand. We offer white ants control from leading suppliers such as Termidor, Biflex and Premise, and have a range of solutions from barrier treatments to bait and monitoring systems. 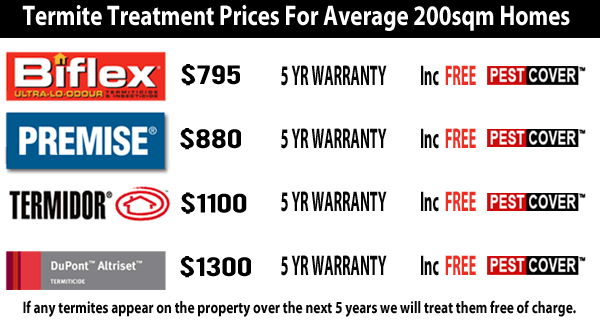 No matter what solution you choose, we give you the peace of mind that comes with having a 5 year warranty. This means if termites appear on your premises within this time, we will treat the area at no cost to you. If you would like to discuss white ants treatment solutions with our team, please feel free to contact our friendly staff at Termipest. Call us today on 1300 66 2847 or by sending us a message via our contact page and we will get back to you as soon as we possibly can.